The American Vietnam War (1964 - 1975) was the third biggest war in the 20th century. 3.000.000 million Vietnamese lost their lives during the war, while 75.000 GI's American GI's were killed. There was also a lot of unrest in America itself, for millions of Americans were mobilizing against this war, and further millions of people in other western countries. There are a lot of documentaries and movies about this war - Apocalypse Now and Rescue Dawn are just two examples. Not many people know that the war did not only happen in Vietnam, but also in Cambodia and Laos. That is because the war against Vietnam's two smaller neighbours has never officially been declared. But it caused more destruction there than in Vietnam itself. The consequence in Cambodia was the total breakdown of civil society and the four years lasting rule of Pol Pot's Khmer Rouge terror regime, which committed a genocide against the Cambodian population, killing two of the eight million Cambodian people. Before the American intervention Cambodia was among the most peaceful countries in the world. By the way: the American Vietnam War is also called the 'Second Indochina War'. The 'First Indochina War' (1946 - 1953) was the French post-colonial war, when France tried and failed to reestablish 'it's' Indochinese colonies after the loss of the II World War. The American Secret Service CIA (Central Intelligence Agency) infiltrated Laos already after the French Indochina War. The CIA initiated from 1960 on a secret war here with a huge impact on the Laotian people in long term. Military air bases were built, among them infamous Long Cheng and others as e.g. the one in Vang Vieng. The Secret War was one of the biggest CIA operations in history and it's official target was, among others, the destruction of the Ho-Chi-Minh-Trail, who was leading through parts of the Laotian-Vietnamese border region in the jungle. The Ho-Chi-Minh-Trail was the supply line for the north-Vietnamese troops leading to south Vietnam. The Secret War also targeted the Laotian communist resistance movement 'Pathet Lao'. Long Cheng, hidden in a high mountain valley in north Laos. The aerial image is from an unknown year. I screenshot it from a youtube movie of Laotian origin. In the next years Long Cheng might be changed into a tourist attraction. Although also the USA accepted Laos on the Genevaer conference of 1962 being a neutral country, President Kennedy ordered in the same year a grand operation there. The CIA built the huge air force base in Long Cheng / Laos, what was growing up quickly. Long Cheng, built inmiddle of the jungle somewhere northeast of Vientiane, became with 40.000 inhabitants the second biggest city in the country, after the capital. It was the largest airport in Southeast Asia at the time. The starting and landing of up to 400 bombers and air freighters per day made it for a time the most busy airport in the world - although it didn't appear on any map, was never mentioned in the news and was even a secret kept against the US congress. This war, officially seen, didn't exist. The CIA led it's own war here. For it's shadow war the American Intelligence recruited a bizarre mixture of mercenaries, anit-communists, arms dealers, extrem right-wing adventurers, veterans of the pigbay invasion (Cuba), Laotian military and - drug dealers. They recruited also big parts of the Hmong people, a mountain people of the region, as soldiers in a secret guerilla armee. The Hmong lost thousands of people in the fights against Laotian communists and Vietcongs. Their war continued for several more decades after the Americans left the region, while they were now under attack of the Laotian army. 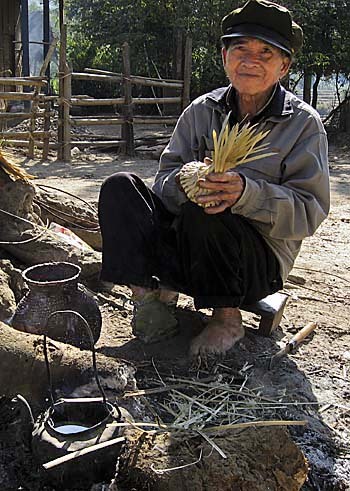 Laos' war against the Hmong is another dark chapter of the American Vietnam War. It's another genozide and a direct result of the American intervention. To finance the large and expensive operations, the CIA initiated a huge opium and heroin trade. The drug production around the Golden Triangle was promoted. 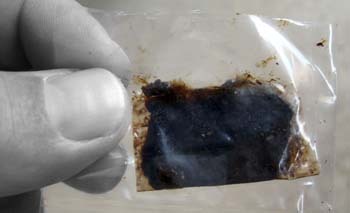 The former local drug trade grew on ten times bigger under the American auspices. Heroin production happened in places like Long Cheng. Due to that, more than 40,000 American soldiers got heavily drug addicted. In the 1970s a third of the GI's was drug addicted, in the US Armee in Indochina were more drug addicts than in the whole USA. Besides, part of the drug trade was dealt under cover of "Air America", a camouflage transport service, targeting the US itself as a drug market. The Hollywood movie 'Air America' (1990, with Mel Gibson), is a reflection of the Secret War and the official-unofficial drug production. From 1964 to 1973 the US Air Force bombed Laos all around the clock. In 580,000 air raids (more than on Vietnam) were 2.1 million tons of bombs dropped on the small country. That's on average every eight minutes a bomb, 24 hours daily, over nine years. That's more bombs than the allies dropped on Germany, Japan and Italy in the Second World War together. The B-52 bombers dropped 2.5 tons of bombs per every single Laotion citizen. 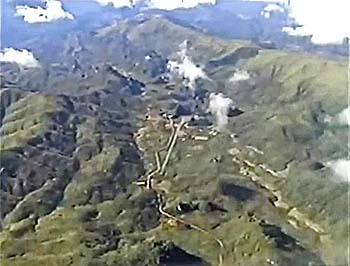 Although there was no industrial infrastructure in Laos to target on. Additionally they used Agent Orange, a strong poison which killes trees and other plants (and heavily pollutes the surrounding environment). There is no reliable number of how many people got killed. 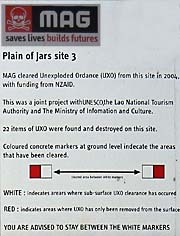 But only in the 50 km radius around Phonsavan on the Plain of Jars were more than 50,000 people killed. On the day before the destruction of the village the pilots shot the farmers water buffalos. Next day they came again. They knew that the people, who fled into a mountain cave, would come back to provide themselves with the meat of the killed animals. Then they bombed the people. Some could run back to the cave and rescue themselves, but for many it was too late. They hide into the school, but the bombers targeted the school. 42 people died on this day, 11 were wounded. Mostly women and children were hit." The aftermath of the secret war is desastrous. 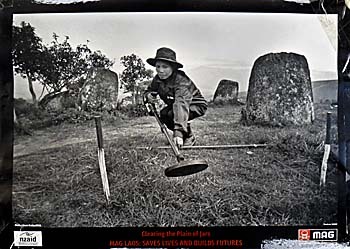 A quarter of the Laotian population were refugees, countless civilians died under the bombardements, the ancient monolithic artefacts on the Plain of Jars heavily and irreversibly damaged, a country driven into chaos, having a decades long lasting civil war afterwards. 80% of the arable land is still endangered by explosives, in an agrarian country. The cluster bomb contamination impairs the further development of the country; people can not use urgently needed land for growing rice and vegetables. The duds are clearly a cause of poverty in Laos. Since a third of the 'bombies' didn't explode, millions over millions of them are still present in Laos. They are hidden under the earth until 50 centimeters deep. If somebody steps on them, or farmers, children, metal-collectors touch them, they might explode and unfold a deadly blast of hundreds of extremely sharp metal splinters. Again and again are also animals killed, cows or the water buffalos of the people, but also wild animals are victims. The people live in a permanent state of fear and wobbliness. Arrable land remains unused. Many Laotians suffer injuries and live-long handicaps from young years on. Boys with a lost finger or hand, a crippled leg. 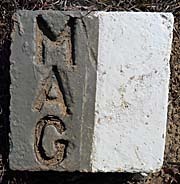 The most victims die soon after the accidents. Five boys play together near a fish pond close to a village. They go there every day and know the place best. But today is different. One of the boys found a 'bombie'. It's a BLU-26, the most common bomb. 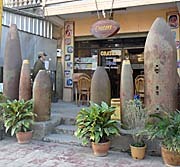 A cluster bomb unit (CBU) of this type contains exactly 670 single bombs, each of them set free between 200 and 300 razor blade sharp metal splinters of the size of a rice corn. When exploding, the splinters fly around for several hundred meters. A single of these cluster bomb units can cover an area of a football field with death and injuries. One of the boys took the bomb, although they all knew how dangerous it is. But nothing happened. The boy threw the bomb in the fish pond. It detonated. Two of the boys, among them the thrower, died immediately, the other three were wounded. Their faces were bleeding, their extremities were hit. They suffer live-long handicaps. About 300 people fell victims annually in Laos in such accidents. Some people don't know that their house is built on a bomb. 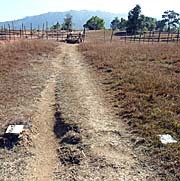 A woman was cleaning the drainage pipe which led under her house which was, typically in Laos, built on posts, and triggered a bomb by touching it with a spade. The explosion catapulted her son six meters high into the air. He was dead immediately. 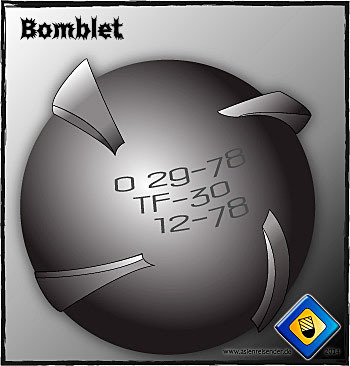 A bomblet is a detonator filled with shrapnels - hacked metal pieces with sharp edges, designed to cause a maximum of harm. A bomblet is about of the size of a tennis ball. They are very strong explosives, splashing their content over hundreds of meters around. 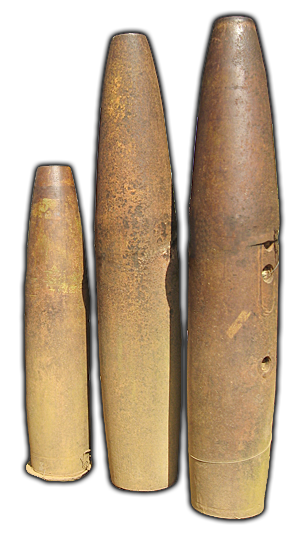 A single cluster bomb contains hundreds of them. 23.1% of all the victims are boys between six and fifteen years old. 38,6% of all victims are children, of whom 53,7% don't survive. Among all the survivers 68% must be amputated, some more than once. Again: a third of these cluster bombs do not explode after being dropped. They are designed not to. They are designed to explode later. They also are not constructed to kill in all cases. They are constructed to injure and handicap people at a certain percentage. That is because then people can not work anymore, but need help and resources from their families. These resources and time and energy the helping people spent for the victims they can not invest anymore in war efforts or anything else what helps the society to survive. Additionally the victims might get stigmatized by others. Many Laotions believe that a victim, which suffers such a heavy accident, is forsaken by all the good spirits around. He is considered guilty in a way for his fate, having a bad kharma. This heavy misinterpretation is a result of the strange superstitions the people here believe in. One of the psychological functions of this certain superstition is to feel save. If one considers himself a 'good' person with a good kharma, he or she has nothing to fear. Besides it's a common appearance worldwide often to stigmatize and blame the victims and justify criminals. 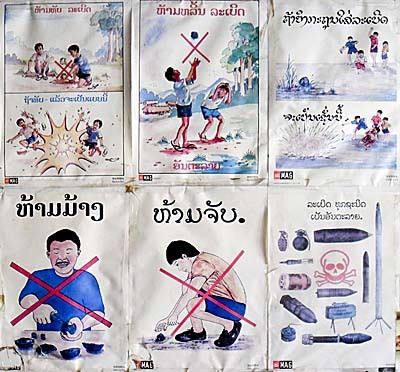 Since all the millions of remaining cluster bombs in Laos are pesting the whole country, terrifying the people, killing children, adults and animals, blocking the development of the country, the contamination is a cause for poverty in Laos. 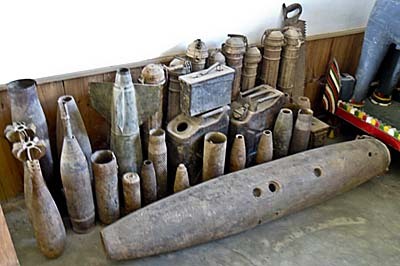 The bombs are in the average some 25 centimeters under the ground and are a common danger for all the farmers working on the rice fields or growing vegetables. In response to that there are international efforts from different countries and institutions to clear at least certain parts of the country of the explosives. 'UXO Laos' for instance, 'Handicap International', 'MAG', a British organization and 'SODI' (Solidaritaetsdienst International) from Berlin, just to name a few. SODI started it's activities in 2009 and cleared more than 230 hectars of land since then. That's about the size of 318 football fields. Some 6,000 duds were made harmless since. Not seldom there are duds found in villages, even schools. For this, SODI has a mobile team for quick responses on that, coming and clearing the area within 48 hours after the discovery. Though, there is still much to do, and probably it will last generations until all of the explosives are removed. Maybe it will never be that all of them are removed - I guess it's impossible. Under all the institutions who help to clear the land in Laos there is not a single American one. One can only speculate about the reasons for that. I guess they can not help because they have no money. They spend more than a trillion dollars (1,000,000,000,000 US$) annually for military purposes (not to count the many also huge shadow budgets invisible for the public). They simply can not spare money and energy for such a minor thing as cleaning a country from the remains of an old war they led. They prefer to concentrate their energy on new wars. In former Yugoslavia, Afghanistan, Iraq, Lybia they used cluster bombs as well. The same thing repeats and repeats again and again and again. Next they might attack Iran, Syria, Venezuela... Meanwhile they use uranium in their ammunition, what pollutes the targeted areas even heavier and for longer. However, the military-industrial complex is the core part of the capitalist industries. Since centuries the modern development is based on it. Who has the military superiority dictates also the trade conditions. The military-industrial complex particularly in the USA is overwhelmingly strong and rules obviously the political decision making. And, above all, war is extremely profitable. To drop millions of bombs on Indochina was not meant to target on military infrastructure or to win the war. It was a self-purpuse to produce, sell and consume bombs and other war materials. There is no business like war business.